We have a great selection of Kids Easter baskets. Choose from smaller baskets with a little candy or larger baskets with a lot of candy. We have baskets not only have candy , but some that have toys too. Coloring books, activity books, decks of Easter card games, Easter themed toys or stuffed animals. Here are a few of our top selling Kids Easter baskets. This is one of our new Easter baskets for kids. 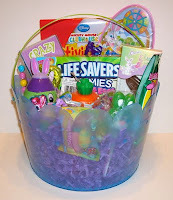 It is a plastic basket that not only has A lot of Easter candy, but also includes toys. including bubble gum eggs, gummy bunny teeth, gummy life saver bunnies, chocolate bunnies and eggs, a carrot stamper filled with jelly beans, a pin ball game, a Easter themed card game and crayons. This basket is filled with chocolate Easter candy, gummy candies, bubble gum and toys. This is perfect for kids of all ages. Not only do they get sweet treats to eat, but also fun toys to play with. 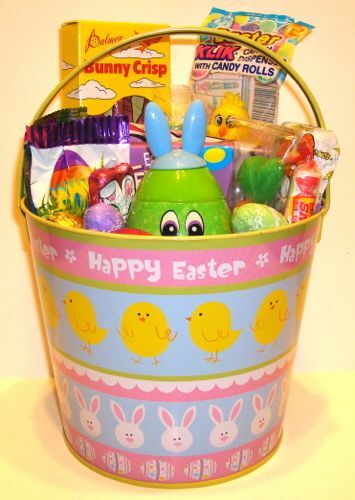 This is a Easter Pail bit smaller , you get a 4 1/2" metal bucket with a Easter Design filled with Easter Candy. Included in this bucket is Easter Fruit Snacks, double crisp bunny, reese's peanut butter bunny, gummy carrots, a Easter smarties dispenser with extra smarties candy rolls, box of jelly beans just to name a few. This is a perfect Easter basket for boys and girls. Each pail is printed with a cute Easter design. There are 4 different designs total, so you may get a different pail that what is shown. This is a fun Easter basket. It has some Easter candy, but also a selection of old time candy and toys all in a cute Easter themed plastic bucket. Some of the candy that you get is Wonka Laffy Taffy, Sour Patch Kids, Bit O Honey bit size, Bite Size Bonomo Taffy, Charms Sucker , Bazooka Bubble Gum, Hot Dog Bubble, Nik L Nips Wax Bottles and a Marshmallow Ice Cream Cone. Besides all this old time candy you also get a Easter stuffed animal, coloring book and box of crayons. These are just a few of our Kids baskets geared more towards kids, however we have found that adults love getting these also. We have many more themed Easter basket that can be found on our Easter Basket page. If you don't see something you want just give us a call and let us know what your are looking for. We can also make up personalized Easter baskets to meet your needs. All of our Easter baskets come in a clear cellophane bag, bow and you can include a gift message. Please not that baskets shown are just a sample of what we carry. Designs, colors and toys may vary.